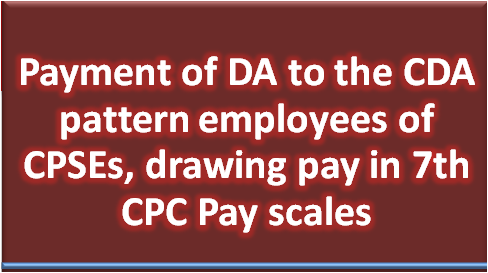 Subject: Payment of DA to the CDA pattern employees of CPSEs, drawing pay in 7th CPC Pay scales. The Undersigned is directed to refe Para No. 3 and Annexure - II(a) and II(b) to this department's O.M No. F. No. W-02/0058/2017-DPE(WC) Dated 17.08.2017 wherein the rates of DA payble to the employees who are following CDA pattern pay scales have been indicated. 2. The DA payble to the employee may be enhanced from the existing rate of 5% to 7% with effect from 01.01.2018. 3. The payment of Dearness Allowances involving fractions of 50 paise and above may be rounded off to the next higher rupee and the fractions of less than 50 paise may be ignored. 4. These rates are applicable in the case of CDA employees whose pay have been revised with effect from 01.01.2018 as per DPEs O.M dated 17.08.2017. 5. All administrative Ministry/Departments of Government of India are requested to bring this to the Central Public Sector Enterprises under their administrative control for action at their end.